or on Pier 86 itself. After 2004 and Jerry’s departure from the Intrepid’s staff, it was hosted by Jerry personally, with help from the National Lighthouse Museum, The Working Harbor Committee (WHC) and a small steering committee consisting of Jerry, John Doswell (WHC), Bert Reinauer (Reinauer Transportation) and Chris Roehrig (Roehrig Maritime). In 2005 the race and event took place in Staten Island, but with no shore-side facility or possibility for spectator viewing. A Reinauer tug and Hughes Bros barge provided a floating place for the line toss and for vessels to tie up for the awards ceremony. This location was not deemed sustainable for the future for several reasons. In 2006 the event moved back to the North River at Pier 63 Maritime, an excellent venue except that places for tugs to tie up were extremely limited and, again a Hughes Bros barge, set in position by two Reinauer tugs and a crane barge, provided a place for the line-toss and vessel tie-ups so that crews could assemble for the awards. John Krevey, owner of Pier 63 Maritime, provided free food and beverages for the crews. However, this location was too close to Chelsea Piers for comfort (due to the huge wake-wash it creates) and the tug tie-up solution was not sustainable. In 2007, a location was selected that seemed to solve most of the problems and was well liked by all – Pier 84 in the North River, just south of the Intrepid’s Pier 86. The CG is happy with the race route starting near the 79th Street Boats Basin and ending off of Pier 84. The pier is large, now functioning as a park, but with decent fendering, cleats & bollards for vessels. It has great viewing for spectators, a food & beverage concession, bathrooms and other amenities. We continue to use Pier 84 from 2007 - present. We added some audience activities (on-pier line toss, knot tying, and a spinach eating contest.) We are hosted by the Hudson River Park Trust, and city/state agency that is building a large waterfront park on Manhattan's west side from the Battery to 59th Street. And we are co-sponsored by Friends of Hudson River Park, and NYC EDC. 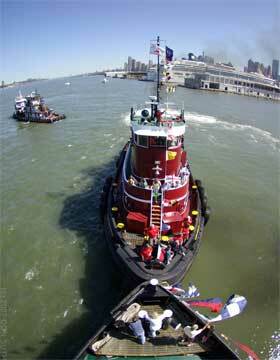 We plan to continue to use Pier 84 for future tug race events. Two tugs compete in a nose-to-nose pushing contest.